I'm still shocked that some of you really think Madison and Jenny would leave their babies just to do a television show. Madison's baby isn't even born and Jenny's baby isn't even a year old. Robin only did the show for financial reasons and that's the only way I see them coming on. Even with that being the case I still see Tony and Brian coming on because a mother's attachment to their child is very different from the father. I don't think it's logical to think you'll see either women on The Challenge for a while. Yeah I agree with you. I don't see it ever happening. TJ periscoped a car ride with a homeless guy right now. He's trying to figure out what to do to help him out. It's a pretty interesting convo. The guy started laughing when they stopped the car and TJ asked what's funny and signed off. Don't know what happened. A lot of fans find them likable , some of them were even defensing zach last season. So? Doesn't mean they actually are. If some fans find them likable it means its an opinion not a fact. I am pretty sure If they ever do a voting thing to cast people Nany, bananas, Zach, Leroy and Even Camila would be on the top.While someone like Emilee wouldnt be find on it. They are popular names though, that doesn't mean that they are likable. These people are on every season and everyone that I know who watches does not like Nany, Bananas, Zach, Leroy or Camila.Cohutta isn't really a popular name name on these shows on wouldn't be voted in the top but that does not mean he isn't more likable than Nany, Bananas, Zach, Leroy or Camila.Popularity and the amount of seasons/times people are shoved into our faces does not necessarily equal likability.Nia is a popular name/interseting cast member who brings drama, but not a likable character. Hahaha ******* dumbest post of the night so far. All the people you named are the most popular & liked people on the show currently. They have tons of fans who like them which is exactly why they keep getting brought back. Just because you & the people you supposedly know don't like them doesn't mean **** to MTV. But just because they have fans/are popular doesn't mean they are likable characters/personalities. Also, Bananas can have 100,000 followers. Doens't mean all 100,000 like him. Also, doesn't mean that the other few hundred thousands of people who watch the show/don't follow him don't like him. He can have 800,000 haters who don't follow him. You guys are only looking at it from one point of view.Donald Trump has followers and supporters. Doesn't mean he's likable. ...Also, my original post was actually talking about me personally/my own opinion. Donald Trump is a frontrunner in the election, he has lots of followers. A lot of people who follow on Twitter like the people. Followers doesn't make you a likable person. Obama has followers and people still dislike him. Donald Trump has followers and is looked at to be a joke of a politician and is a pretty hated man amongst a lot of people. Amanda Bynes gained a lot of followers as she got crazy. A lot of people also follow people on twitter that they do not like. People tweet people hate all the time. They don't just follow people because they like them. That's obvious. A lot of people follow the President on twitter. That doesn't mean 100% of his followers like our President. Cohutta has less followers than Bananas, Nany, Camila, Leroy etc. Bananas, Nany, Camila, Leroy etc. are NOT a more likable person/character than someone like Cohutta. Are they more entertaining? Maybe. Do they have more of a prescent on the show? Yes Are they more likable? No. Followers doesn't make you a likable person. Obama has followers and people still dislike him. Donald Trump has followers and is looked at to be a joke of a politician and is a pretty hated man amongst a lot of people. Amanda Bynes gained a lot of followers as she got crazy.A lot of people also follow people on twitter that they do not like. People tweet people hate all the time. They don't just follow people because they like them. That's obvious. A lot of people follow the President on twitter. That doesn't mean 100% of his followers like our President.Cohutta has less followers than Bananas, Nany, Camila, Leroy etc.Bananas, Nany, Camila, Leroy etc. are NOT a more likable person/character than someone like Cohutta. Are they more entertaining? Maybe. Do they have more of a prescent on the show? Yes Are they more likable? No. I personally think a following = likable to those who follow them. I've never heard of anyone following someone even if they don't like them to me that doesn't make sense because if I didn't like someone why would I want to see their daily post? Again it is all opinion really because I think all the challengers you mentioned above are somewhat likable in certain scenarios just some more than others. People follow for news, information, updates, trash talk, etc. A lot of people follow Obama because he's our president. Not everyone who follows him likes him. People may follow Amanda Bynes or Donald Trump for comedic relief, to see what they say/to find out what they are doing. People who watch the challenge my follow everyone on the cast. Same with BB or Survivor. That doesn't mean they necessarily like them. I'm sure people who hate Bananas follow him just to see what he says. People may also follow someone because they are good looking. It deff is personal opinions but those people are not likable people over others. People who fight, constantaly get drunk, have several hookups, are coniving or mean/rude to other people, bullies, etc may be more interesting and entertaining characters for the show, but not likable characters or personalities. Wait does Leroy still have a Twitter? @abramBoise: Some have made accusations that I have hurt @CaraMariaMTV or bullied her. This is false. Even now, I support her-it's what loyal friends do. I have no apologies for getting mad on the aftershow- I had been betrayed by those I loved most - my response was from absolute heartbreak. I also did offer Tom to go outside & box me for 1 round with gloves & we would be square, I even offered to but a beer after...he declined. I believe in treating people with respect. I believe in my principles with fierce conviction-& in protecting family & showing you love them. I would have screenshot it but it was like 5 tweets and it would be from last to first. There is no right or wrong-life isn't a test. There are no riles-we have to make our choices to the best of our ability. IMO for Abram to come out and say that stuff says a lot. 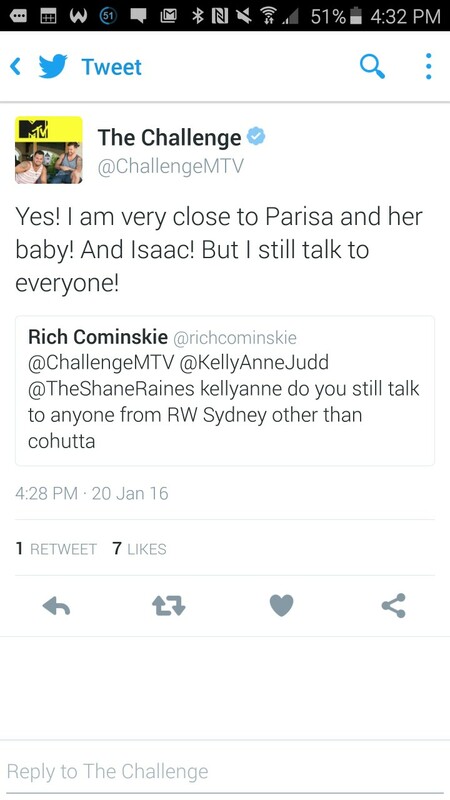 He only does the shows for the money and I believe it was stated that he doesn't follow up with the challenge or watch the challenge so for him so say that I think is big and I think he got a lot of heat. Almost had a hurricane Nia moment on the way back from my evening jog. Thank god I can count to ten. i really hope she will come back. KellyAnne needs to win! Kellyanne's response makes no sense. How did Cara and Jamie screw them? 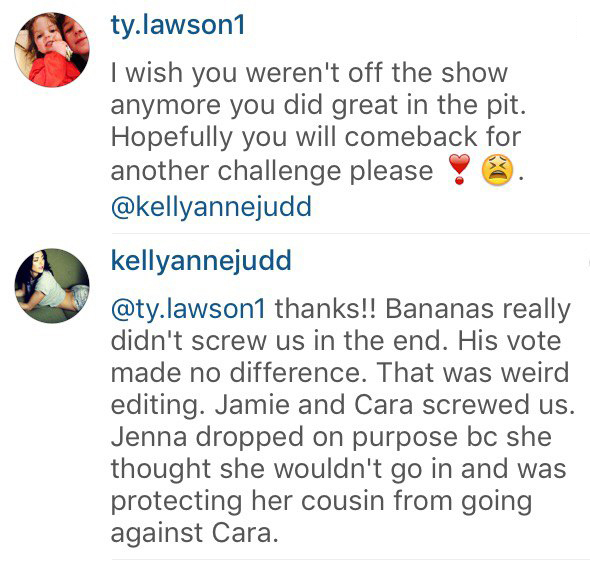 Jamie completed the challenge for the blue team and no way is Cara going to purposely lose knowing she would go in the pit just to protect Kellyanne. Cara may be good in elimination but these eliminations have been stupid. Anyone could win these without having to be a good challenger. 100% agree with you. i actually like KA but how in the world did CM/jamie screw them? jamie actually completed the challenge unlike anthony who fell on purpose. KA and Anthony were the ones trying to screw CM and Jamie and it just failed miserably and backfired on them. 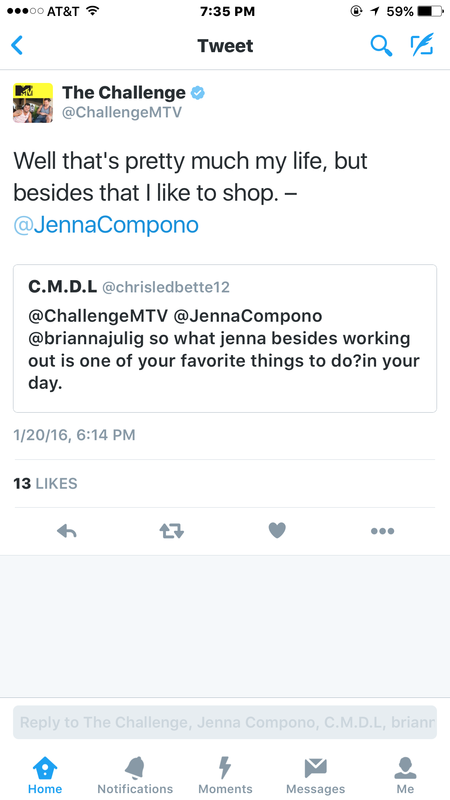 Rivals 4 incoming but this time in teams of 4 with CM,Jamie,KellyAnn and Anthony lol, she should be more mad that regardless of the editing Johnny threw her name in the elimination just to look good ( honestly if he had backed up Nany and now KA he would be looked with way more respect that now). Dicey09 wrote:Kellyanne's response makes no sense. How did Cara and Jamie screw them? Jamie completed the challenge for the blue team and no way is Cara going to purposely lose knowing she would go in the pit just to protect Kellyanne. Cara may be good in elimination but these eliminations have been stupid. Anyone could win these without having to be a good challenger. Jenna and I are one. Isaac was hilarious on Duel 2 though! What? Issac had a funny *** exit interveew that season. That alone is more than anything Preston's useless *** has done. I'm still mad that we didn't get that Sydney team on Seasons 2. Not only would they have been refreshing much like the rest of the cast but we would have been spared of that ****** **** of a team called Fresh Meat. But it's cool that KellyAnne still talks to people from her show. lmaooooo BYE Mark. 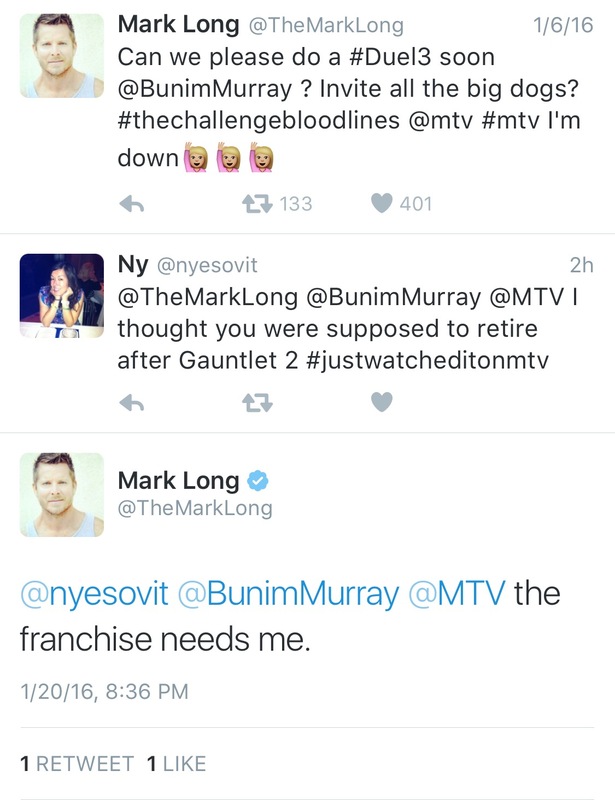 He has retired twice already and had a montage of his Challenge career after he got eliminated on Battle of the Exes so he can stay home. LMAO. No, they really don't need you, Mark. Unpopular opinion: I'm not entirely against Mark coming back. Just not with Bananas on the same season cause you know he's gonna be the first one on his lap.